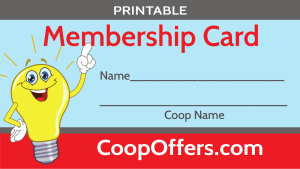 5% off total bill for Co-op Connections card holders. 20% discount on any order over $100. Offer good only on printing and sign work. 10% discount in our gift shop/book store. 10% off total. Excludes tires. Receive 3 months of free monitoring. New installation only. 20% discount on dues for our 18 month membership and also no enrollment fee. Free 7 day pass, 10% off standard monthly dues, 50% off enrollment. Must join for 12 months or more.